Was wondering what kind of sign was going to be there for the good-size footing you showed - big heavy buggah! Nice form work. I hear you on the gravel, except mine is 'a'a. I'm thinking of building a rock wall which will involve a lot of concrete. Darn... I was waiting for your critique of Monday's 5-0. Nate- that soil has poor bearing capacity to say the least, and the concrete extends 6-ft below the surface. 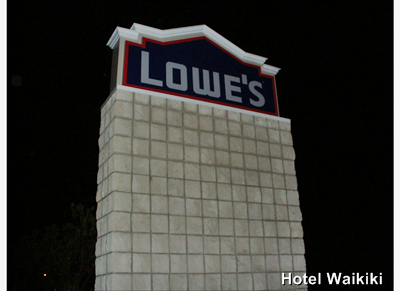 I guess the amount of concrete is more to ballast the light pole and anchor the high and narrow CMU wall for the store sign. hawaiian island- you don't necessarily need as much concrete as it might seem for a stone wall, itself. I believe they just substitute junk material, not suitable for veneer, as filler in the core of the wall, reducing the volume of concrete needed. If your wall is high, than you might need a concrete foundation (footing) for stable bearing, with perhaps two ½-inch rebars (#4) running the length of the wall, splices overlapped 2-ft. Typically, the concrete footing is 4-inches wider, on both sides, than the width of the base of the wall, 4-6 inches deep. It might even be required to comply with the municipal building code, Nate (above) is head honcho on construction projects and oversees entire jobs so he's more knowledgeable about the legal aspects. 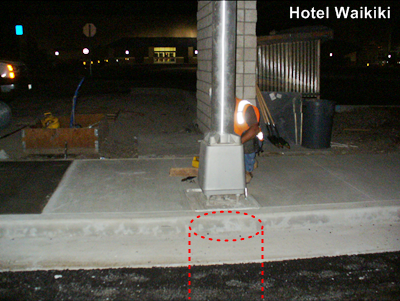 A concrete footing can cost a lot in concrete but the wall will last for years without sinking at spots and make it look dilapitdated. Kay- LOL, has been no tv or Internet for me. Our crew is pau with that job, but the last day really got to me, 12 hours, no lunch, never sat down for a minute, which wouldn't have mattered to me if it weren't (darn it) for my feet was aching like I was the official spokesperson for Dr. Sholls. Cloudia- the credit belongs to the rest of the trades that came after we built the foundation. Mind you, they had the cleaner work.